The Bureau of Administrative Reviews (BAR) of the Florida DHSMV has been busy writing memorandums explaining their interpretation of the administrative rules and how the rules apply to the new telephonic hearings. Please leave a comment if you disagree with our strategy or use a different strategy. File a notice in the criminal case that discloses each subpoena / subpoena duces tecum issued with a copy of each subpoena attached as an exhibit and mail a copy to the prosecutor. (You may be going back later to see the judge to enforcement the subpoena / subpoena duces tecum. The prosecutor must be notified of the subpoenas so filing a notice is just as easy). Write a $5.00 witness compensation check to the witness and attach the check to the subpoena. (If you are serving a subpoena duces tecum on the witness then include a second check to cover the copy costs). proof of payment of any other check intended to cover copy costs for a subpoena duces tecum. How do you make arrangements to pay any costs to obtain subpoena duces tecum items, manuals, cumbersome items or DVDs from the law enforcement agency? It might be a good idea to send a separate check with the subpoena for the anticipated costs and a formal request for the items. If you are requesting the DUI video, then you could include a blank DVD. Then if the items are not provided to you before the hearing, move to continue the hearing with a temporary permit to enforce the subpoena. You can file the motion to enforce the subpoena in front of the judge that has the criminal case. You can use the request and check for the reasonable copy costs to prove that you complied with the rules. So what does the memo mean when it says: “If the video is to be viewed at the hearing, all parties must have the ability to view the video at the time of the hearing in their respective offices.” How is that suppose to happen in a telephonic hearing? So if you serve a subpoena duces tecum for the DUI video, object to a procedural due process violation if you do not receive a copy of the video in advance of the hearing. Alternatively, you can ask the hearing officer to play the video during the hearing and object to due process if you, the witness, and the hearing officer are not all able to view the video at the same time. Subpoenas are issued for the officers and witnesses identified in documents pursuant to sections 322.2615(2), 322.64(2) and 322.2616(3), Florida Statutes, and pursuant to R. 15A-6.012, F.A.C. If a subpoena duces tecum is requested, it shall be described with particularity and specificity any materials to be produced and the relevancy of such materials pursuant to R. 15A-6.012(1), F.A.C. Pursuant to section 92.142, Florida Statute, witness fees are $5.00 per day plus 6 cents per mile round trip. 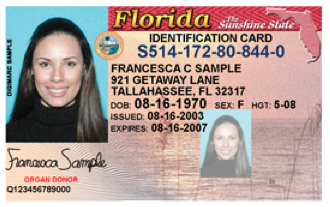 Section 112.061(7)(a)(d), Florida Statutes, allows public officers, employees and authorized personnel 44.5 cents a mile whenever travel is by privately owned vehicles. Subpoenas should be served pursuant to section 48.031, 92.141 and 92.142, Florida Statutes. Written notice, including a copy of the subpoena, must be provided to the individual Assistant Sate Attorney assigned to the DUI case, or the appropriate state attorney’s office if no prosecutor has been assigned to the DUI case pursuant to R. 15A-6.012(5), F.A.C. Proof of service must include: date and time of service; payment of witness fee; names of person who accepted service; certification of service by the person who served the subpoena; and written notice to the appropriate state attorney’s office. See, R. 15A-6.012(4), F.A.C. Subpoena duces tecum items for formal reviews, other than what the officer submitted pursuant to sections 322.2615, 322.2616, and 322.64 to the Bureau of Administrative Reviews office prior to the hearing, will need to be submitted to the hearing officer prior to or brought to the hearing. 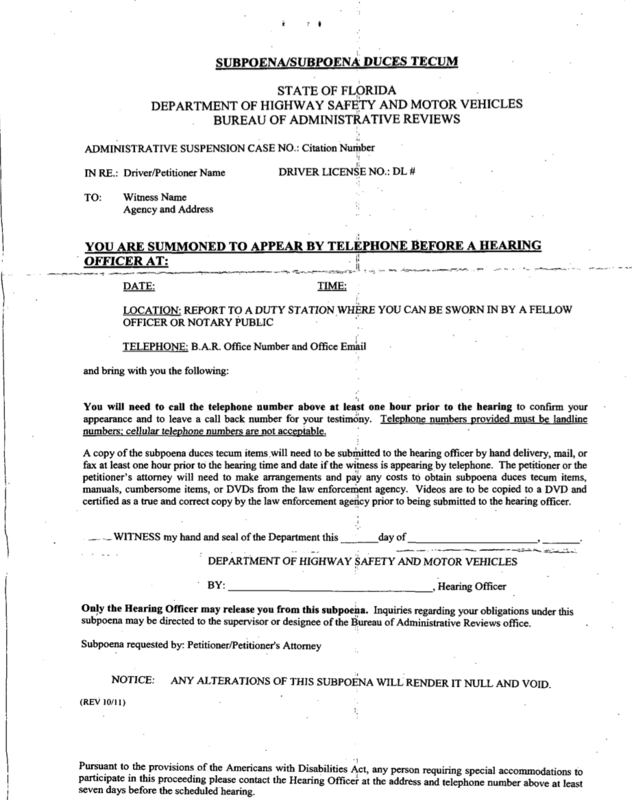 A copy of the subpoenaed item(s) can be delivered, mailed, or faxed to the hearing officer at least one hour prior to the hearing date and time unless brought to the hearing in person. The petitioner or petitioner’s attorney will need to make arrangements to pay any costs to obtain subpoena duces mecum items, manuals, cumbersome items or DVDs from the law enforcement agency. Discovery subpoenas will not be issued. Videos are to be copied to a DVD and certified as a true and correct copy by the law enforcement agency, prior to it being submitted to the hearing officer. If the video is to be viewed at the hearing, all parties must have the ability to view the video at the time of the hearing in their respective offices. Read more about the new procedures for telephonic formal review hearings. You will need to call the telephone number above at least one hour prior to the hearing to confirm out appearance and to leave a call back number for your testimony. Telephone numbers provided must be landline numbers; cellular telephone numbers are not acceptable. 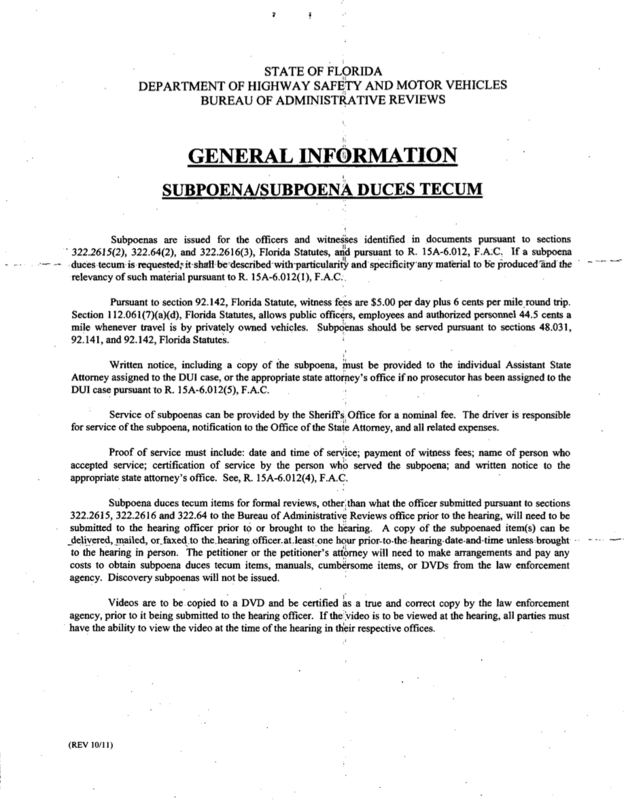 A copy of the subpoena duces tecum items will need to be submitted to the hearing officer by hand delivery, mail, or fax at least one hour prior to the hearing time and date if the witness is appearing by telephone. The petitioner or the petitioner’s attorney will need to make arrangements and pay any costs to obtain subpoena duces tecum items, manuals, cumbersome items or DVDs from the law enforcement agency. Videos are to be copied to a DVD and certified as a true and correct copy by the law enforcement agency prior to being submitted to the hearing officer. WITNESS my hand and seal of the Department this ____ day of ______________, 2014. Only the Hearing Officer may release you from this subpoena. Inquires regarding your obligations under this subpoena may be directed to the supervisor or designee of the Bureau of Administrative Review office. NOTICE: ANY ALTERATIONS TO THIS SUBPOENA WILL RENDER IT NULL AND VOID. Pursuant to the provisions of the Americans with Disabilities Act, any person requiring special accommodations to participate in the proceedings please contact the Hearing Officer at the address and telephone number above at least seven days before the scheduled hearings. This entry was written by lsammis, posted on October 30, 2014 at 22:34, filed under Tampa DUI Attorney and tagged Administrative Suspension, Bureau of Administrative Reviews, Formal Review Hearing. Bookmark the permalink. Follow any comments here with the RSS feed for this post. Post a comment or leave a trackback: Trackback URL. 1. There is no need to pay a server to serve the Written Notice to the State attorney, I think you can just mail it certified mail or even email it to the state attorney. 2. You don’t need to attach “Certification of Written notice” to the subpoenas that you serve to the witnesses. I agree. I think I’ll edit this article to reflect those points. I’m representing myself pro se and your site provided a lot of help, Thanks! if you want to get involved in taking a case of: “anonymous BOLO + unlawful stop with no traffic violations + took a breath test” and take it to the supreme court let me know. We can make them change the language in Hernandez to include people who agree to take the test. the only significant case I found was this (for illegally arrested people who took the test): CARRIZOSA v. DEPARTMENT OF HIGHWAY SAFETY AND MOTOR VEHICLES, Case No. 2D12-5336 (FL Dist. 2 Ct. App., Nov. 6, 2013).